What Is a Skirt Board on a Window? Door casing is an architectural trim element installed around the perimeter of a door. This type of trim is most often found on residential doors, and cannot be used with the metal door frames for most commercial applications. Door casing is also known as "brick molding" when used on the exterior of the home. 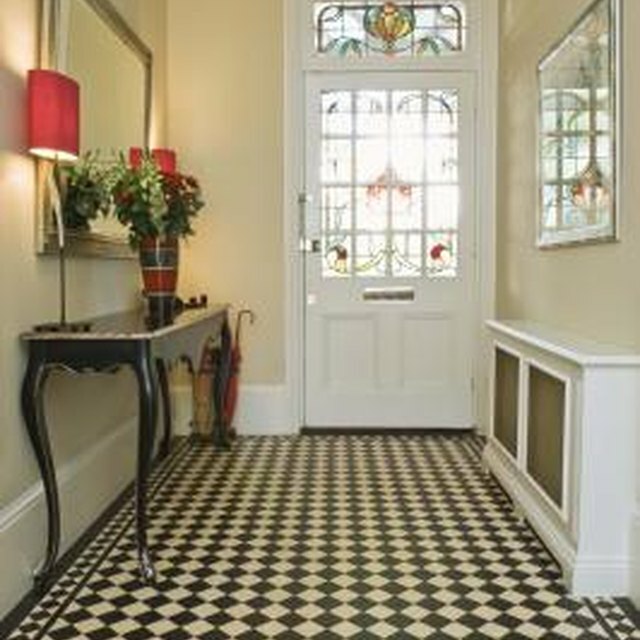 The right casing can transform the look of a doorway. In most applications, door casing serves both a functional and aesthetic function. It covers the gaps between the edges of the door frame and the surrounding wall, which helps the door blend in with the wall more effectively. By covering these gaps, door casing also blocks air drafts, pests and dirt or dust from passing into the home. Like all trim, door casing also creates a decorative addition to a room, and even may help the entire opening serve as a visual focal point within a space. You can install door casing on one or both sides of the opening. For many pre-hung units, the casing is built into one side of the frame to help align the door and hold it in place during installation. If installers wish to use casing on the remaining side of the door, they can add separate trim pieces, which may be included with the unit. Door casing is set so the edges are flush with the edges of the opening, and the corners are often mitered to create a clean, smooth joint. Casing looks best when a single length of material is used along each side of the door. Installers can fasten the casing in place using small finish nails or screws for extra security. Casing is made from solid wood, composite wood products, plastic or metal. Depending on the material, it is either pre-finished by the manufacturer or field-finished using paint or stain. The trim that lines the vertical edges of the door is known as "jamb casing," while the horizontal trim member along the top of the door is known as the "header" When the casing around the jambs is very thick and ornate, it may resemble a traditional column or pilaster. Many older homes feature an elaborate header trim known as a plinthe. The plinthe may be engraved with a family crest or other design, or may even feature a frame that contains stained glass or another form of viewing window. The types of door casing are often distinguished by their appearance, or profile. The most basic trim features a smooth surface with squared or rectangular edges. More modern casing may be rounded or sloped to create an up-to-date finish. An infinite number of elaborately carved profiles also are available for those trying to create an ornate finish. No matter what the profile of the casing along its face, the edges that sit perpendicular to the walls are almost always squared or flat. This allows other types of trim, such as chair or picture rail, to fit flush against the edges of the door casing. Many homeowners select door casing that matches other trim within the room, particularly window casing or crown molding. Compared with these other trim elements, door casing is traditionally smaller and less elaborate, but may still feature the same basic design. For an affordable alternative to custom trim, homeowners can use different types of simple trim to create a custom design. For example, a square length of casing topped with quarter-round molding or smaller carved sections can mimic the look of more expensive trim, but costs a great deal less. How Big of a Bulkhead Do I Need?